The vaccine industry, medical establishment and government have convinced millions of people that vaccines are one of the greatest medical advancements in history. Consequently, believers believe in the salvational value of vaccines in much the same way that people of faith believe in the salvational value of religious sacraments. Germs are bad and vaccines are good. Period. Questioning the dominant paradigm results in shaming, scapegoating, and in some cases tainted reputations, lost careers or worse. Such an environment is not the domain of science; rather it’s the breeding ground of tyranny and fascism. Corporate and personal profits from the burgeoning vaccine pie depend upon the larger-than-life, myth-based vaccine paradigm. Sociopaths inject this paradigm into medical journals, medical curricula, congressional hearings, regulatory policies, White House statements, executive orders, and finally into the minds of vaccine believers. Million dollar sociopathic propaganda campaigns ensure that vaccine believers unleash their wrath against the vaccine informed, effectively keeping The Herd immune to the truth and ready and willing to roll up their sleeves to any and all vaccines currently on the schedule and to those yet to come down the vaccine pipeline. In spite of and in part because of the propaganda, the number of vaccine informed individuals is increasing. 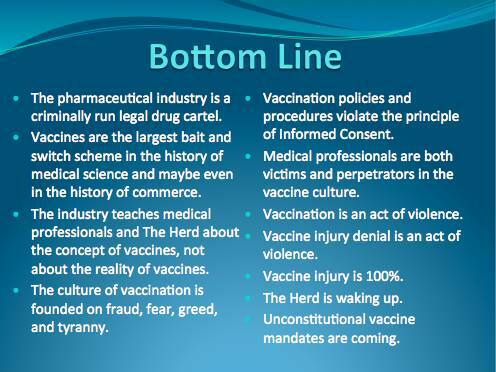 The day is soon coming when consumer distrust of vaccine sociopaths will gut the vaccine industry. Don’t expect the sociopaths to roll over, play dead, and sacrifice their multi-billion dollar generating machine, however. Human bodies are, after all, their ATMs. The waves of coercive and mandatory vaccination laws that are rolling out across the USA and beyond demonstrate that if sociopaths are denied voluntary access to our bodies, they will take them by force. The force of law. A vaccine informed public is the only thing that will have the power to stop them and to hold them accountable for their crimes. 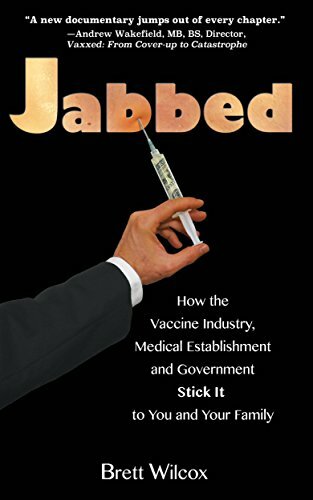 Jabbed exposes the vaccine paradigm, provides an accurate accounting of the sordid history of vaccinations, details conflicts of interest, warns against the unethical policies and practices of the American Academy of Pediatrics, shines light on the complicity of medical professionals, highlights the story of William Thompson, the CDC whistleblower, and celebrates the powerful role the documentary film Vaxxed is playing in exposing government fraud and awakening the public. In short, Jabbed informs and immunizes against three of the most dangerous epidemics in history: tyranny, greed, and corruption. About the Author Brett Wilcox is a Licensed Professional Counselor. Through Brett’s work and research, he discovered that abusers at home, in industry, and in the government use the same tactics to gain and maintain control over others. In 2013, Brett authored We’re Monsanto: Feeding the World, Lie After Lie, Book I. In 2014, he and his 15-year old son, David, ran across the United States advocating for a GMO free USA. In 2015, Brett published his second book, We’re Monsanto: Still Feeding the World, Lie After Lie, Book II. While running across the country, Brett and his family met parents of autistic children. Some stated that their healthy children suffered vaccine reactions leading to their regression into autism. Shortly after finishing their run, Dr. William Thompson—the scientist now known as the CDC whistleblower—acknowledged that he and his colleagues had buried the link between vaccines and autism. These events compelled Brett to investigate the vaccine industry, which led to the incontrovertible conclusion that “the world’s greatest scientific achievement” is built upon fraud, greed, corruption, and tyranny. Brett blogs at RunningTheCountry.com.